And now we're back to the Cambodia posts! 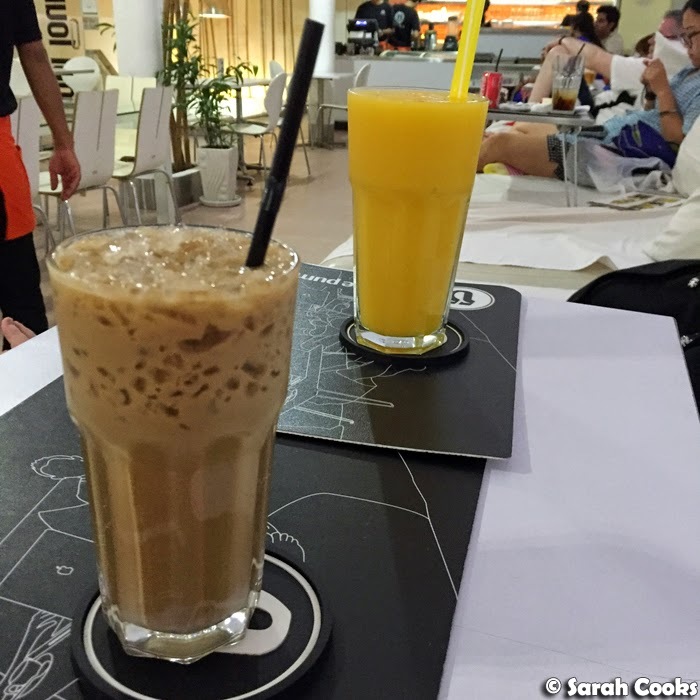 Today I wanna tell you all about the different restaurants we visited on our holiday. 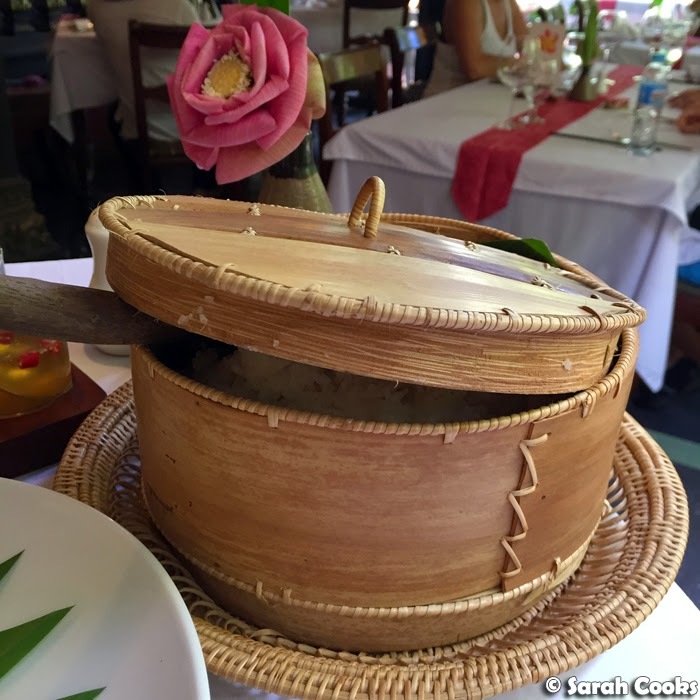 This was our first visit to Siem Reap, and we chose places to eat based on recommendations from locals and friends, TripAdvisor reviews, and just by what looked good while we were walking around town! 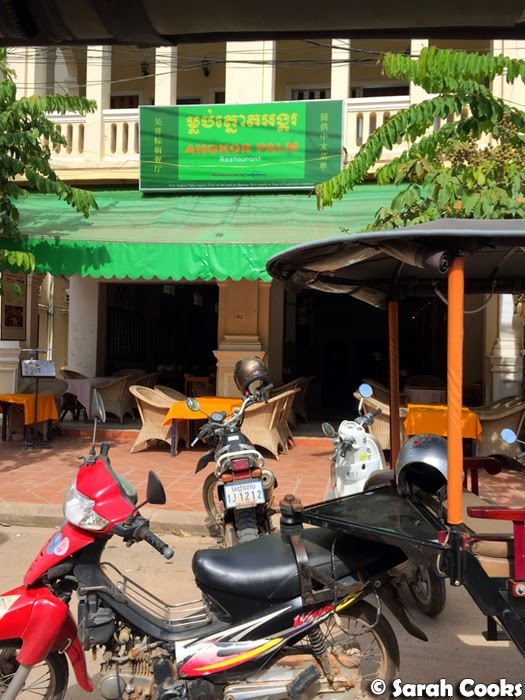 Bhopa Angkor is a hotel overlooking Siem Reap river, with a pleasant and slightly upmarket restaurant serving Khmer food. This place was recommended to us by our awesome temple tour guide Pat, and we really liked it. We'd built up a huge appetite trekking around temples all morning, and appreciated the generous portions, icy drinks and cold towels. Angkor Palm is in the old market area, and comes highly recommended by Lonely Planet - and now, me! 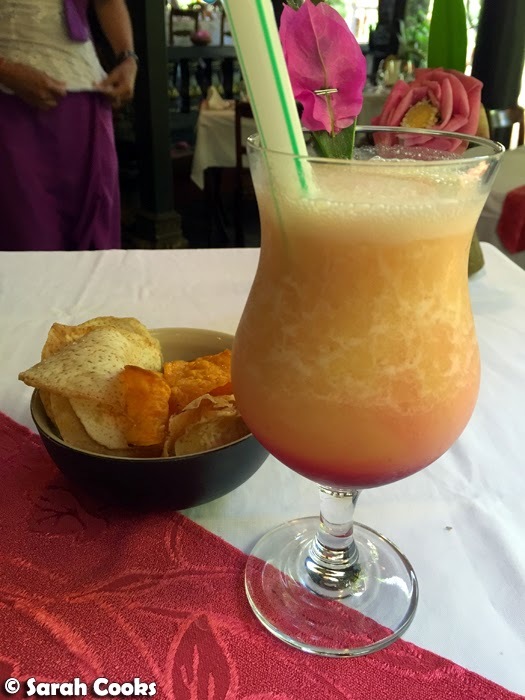 As with Bhopa Angkor, Angkor Palm was our choice for a relaxing lunch after another huge morning of temple trekking. 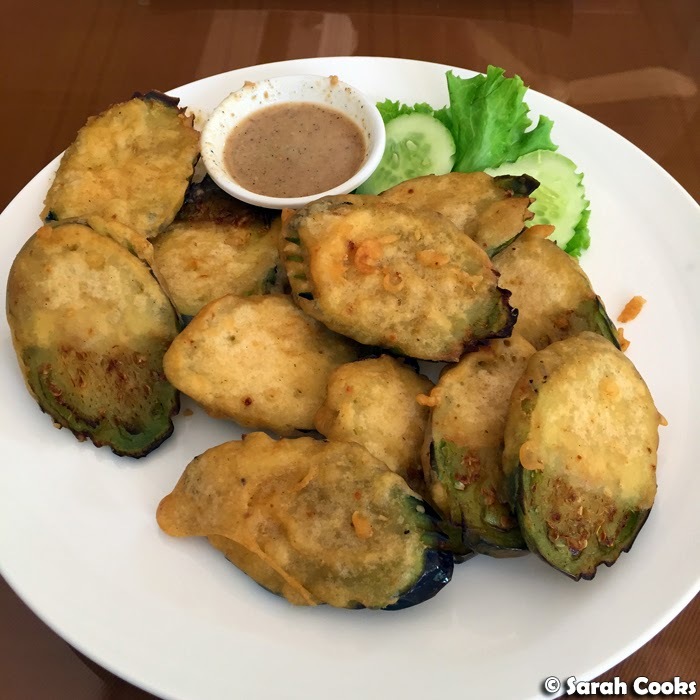 Deep fried eggplant is always a winner, and the one here was great - crisp and light, and squishy on the inside. The lime dipping sauce with kampot pepper was delicious as well. 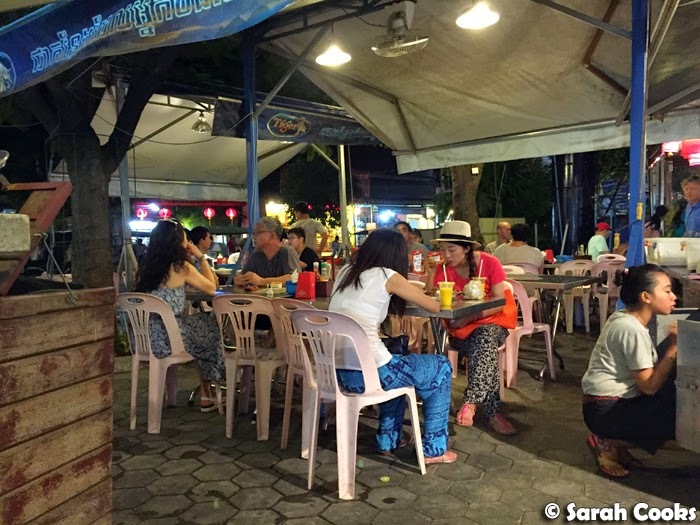 Sandra and I shared their famous Angkor Palm Platter for One, and a plate of beef with long beans. 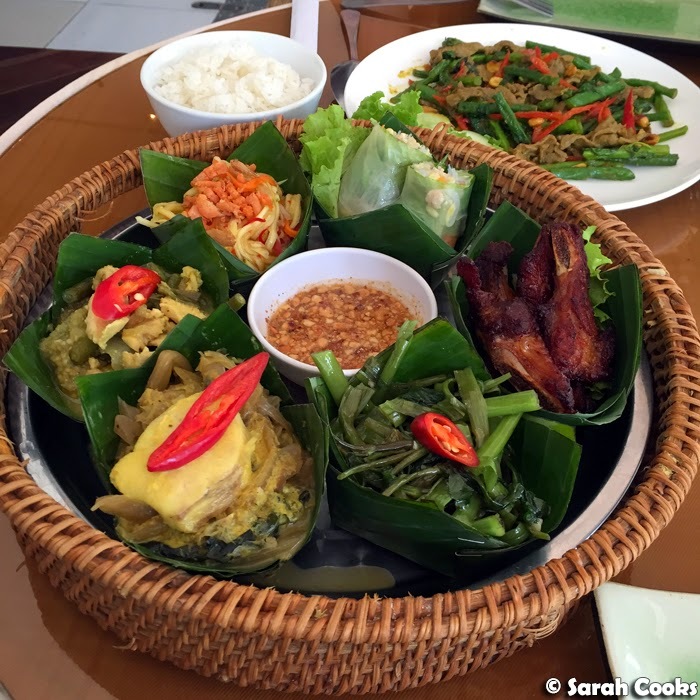 I thought it would be a good way to try a lot of Khmer specialities in one go. The Platter for One was a very generous serving - I actually think it's easily enough for two people, so I'm glad we didn't order one each! 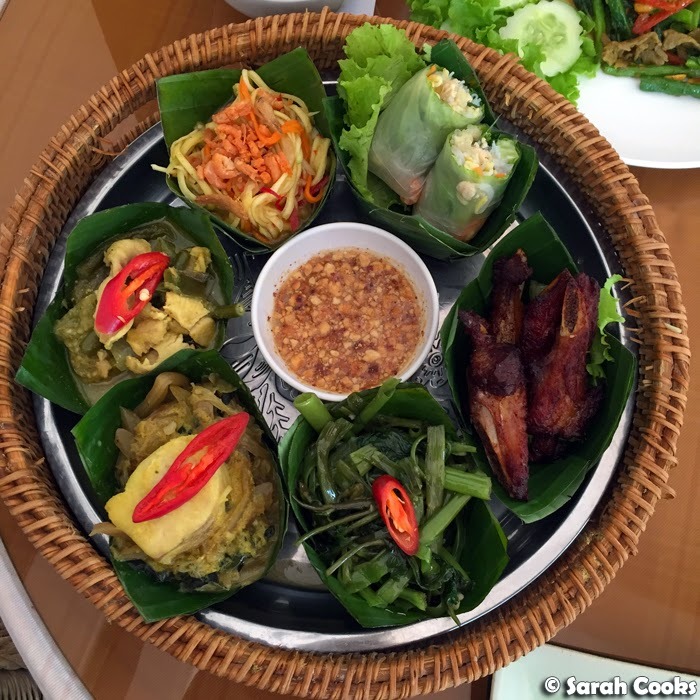 Clockwise from the top: fresh spring rolls; green mango salad with smoked fish; green chicken curry; fish amok; stir fried water spinach; pork spare ribs. The fresh spring rolls, mango salad and green curry were very familiar to me, being very much like the Thai and Vietnamese versions that are ubiquitous here in Melbourne, just a lot milder. 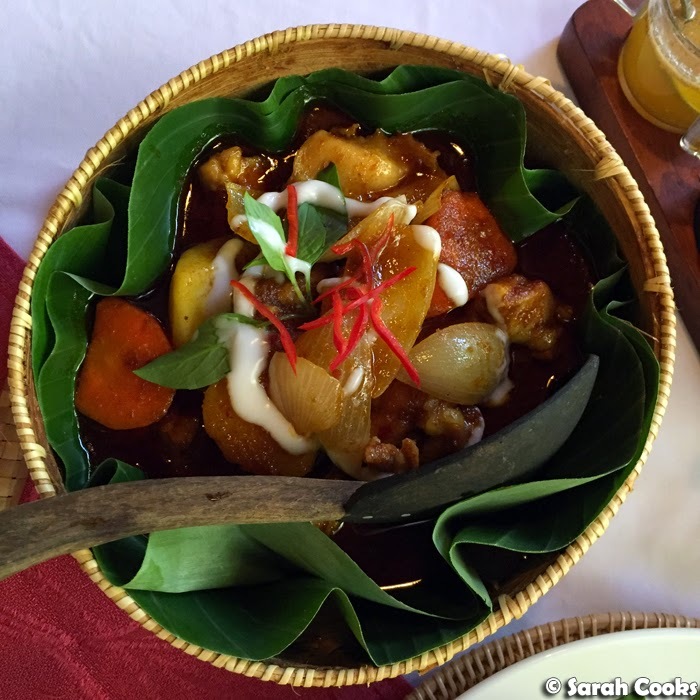 The fish amok was full of firm, fresh white fish pieces in a delicately spicy sauce. I always like water spinach, and the version here was crunchy and fresh and had a nice salty sauce. Finally, the pork spare ribs were quite toothsome and very tasty. Rice and a dessert were also included in the platter - they gave both of us a dessert even though we only ordered one platter - yay. 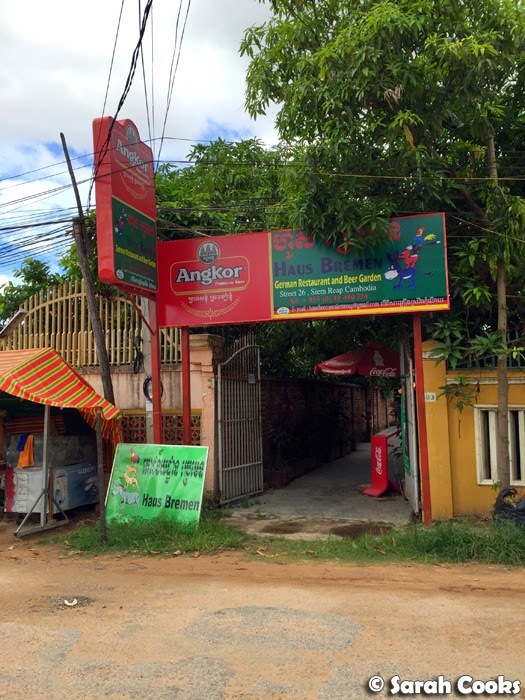 I was very impressed by Angkor Palm, and if you don't have a lot of time in Siem Reap, this is the place I'd suggest. Sugar Palm seems to be quite well-known - Gordon Ramsay visited here once to learn how to make amok, apparently! 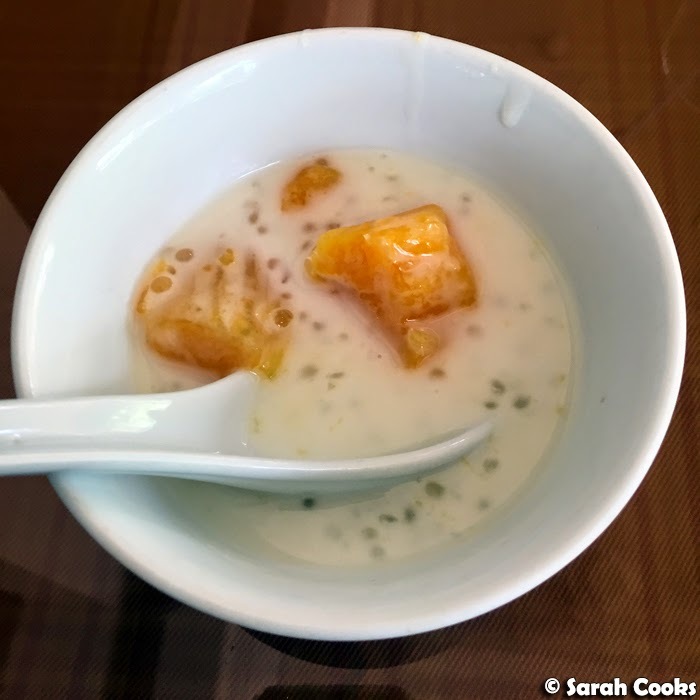 Earlier that day, when we asked the front desk at the hotel to organise a tuk tuk to Angkor Palm, three different staff were all like: "Oh you mean Sugar Palm? I know Sugar Palm!" We figured that was a good enough recommendation to try it for dinner! It was really nice to sit on the first floor balcony as the sun set. 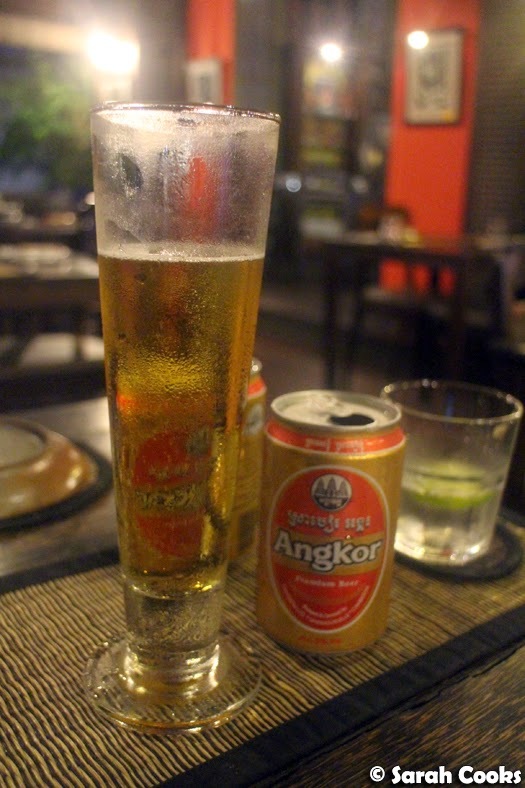 Angkor beer is super light, perfect for warm nights! 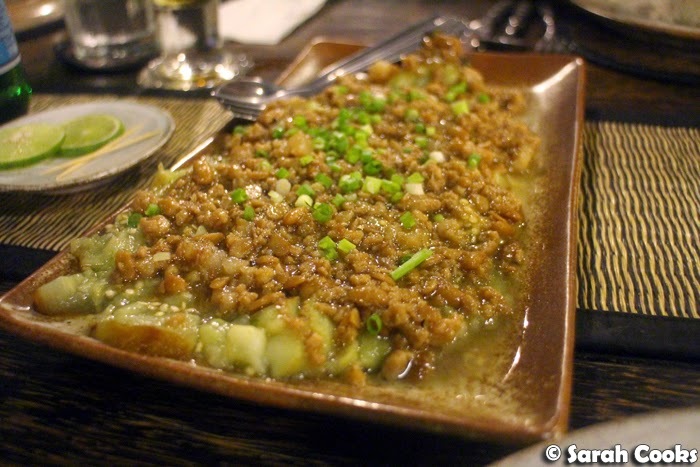 I loved the grilled eggplant - smoky soft eggplant topped with pork mince. So good! There was a recipe for it in the cookbook we were given at the cooking class - can't wait to try it at home! 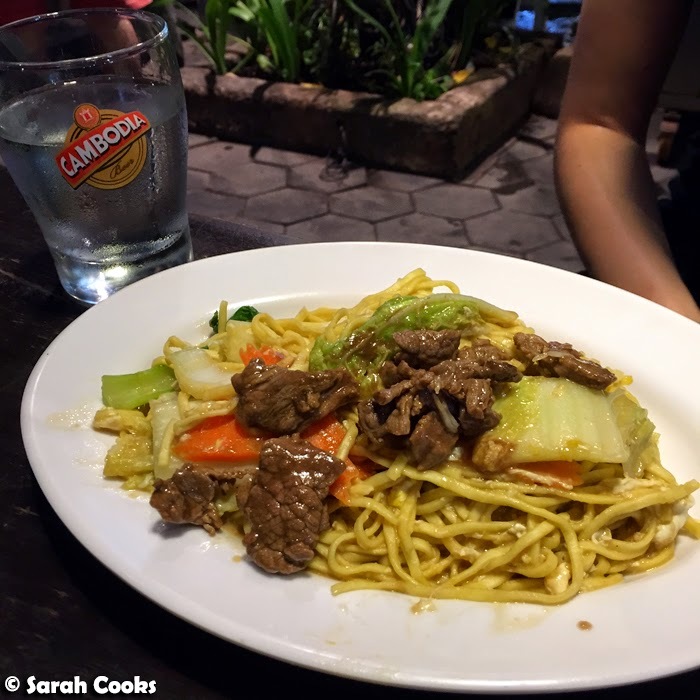 We really liked the crisp, puffy texture of the noodles - perfect for soaking up all that flavourful sauce. 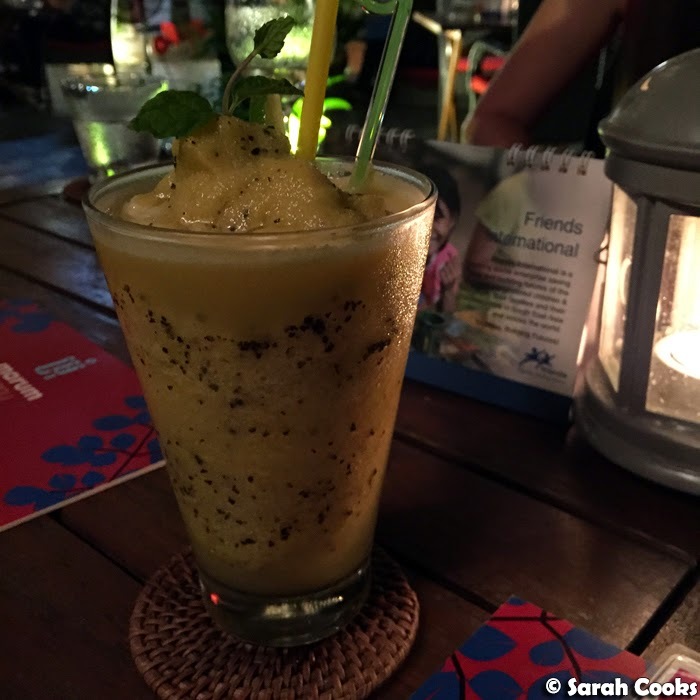 The Blue Pumpkin is a popular bakery and cafe with branches throughout Siem Reap and Phnom Penh. 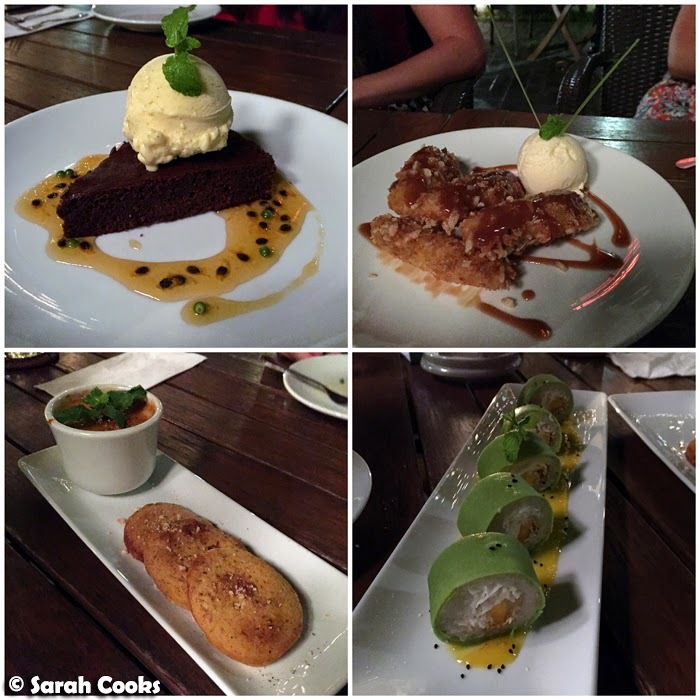 We stopped in for deeelicious ice-cream after our dinner at Sugar Palm - they have a great range of classic and local flavours. 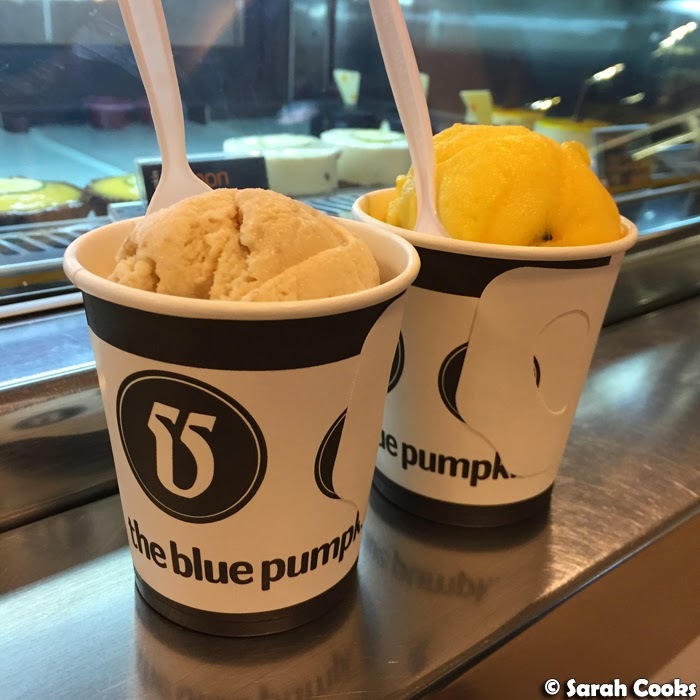 I got a scoop each of peanut and coffee, and Sandra got passion fruit and green lemon. The peanut flavour was my favourite! Upstairs at The Blue Pumpkin is an air-conditioned lounge with free WiFi and comfy couches. We came here one afternoon to enjoy gigantic icy drinks and escape the rain. 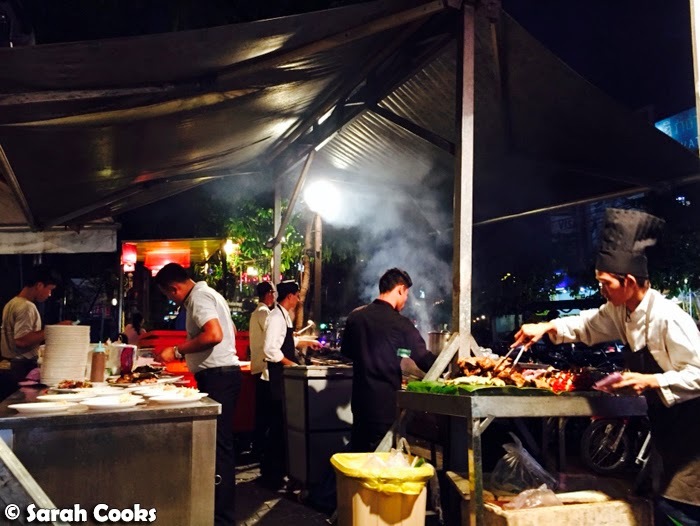 We came across BBQ Lovers one night when we were shopping in the Night Market. We were hungry and had no idea where to go - we just followed our noses and the smell of barbecue was too good to resist! 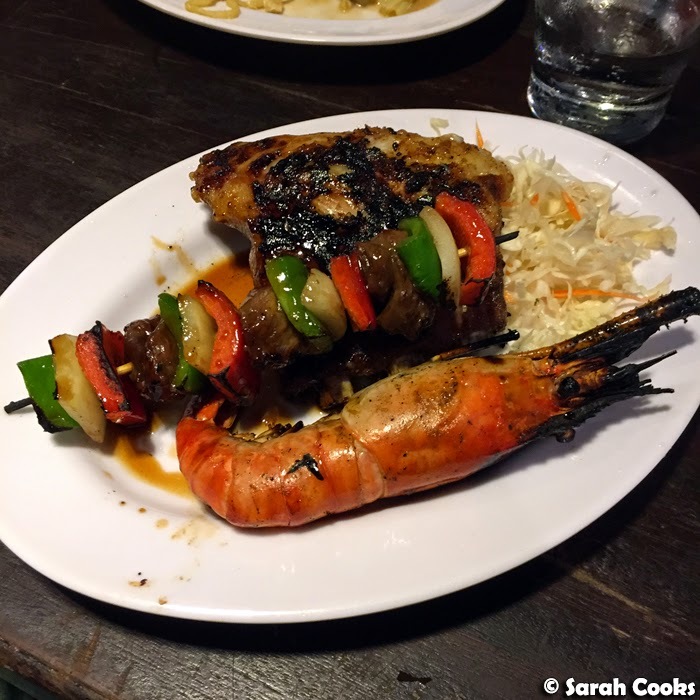 BBQ Lovers barbecue a range of meats and seafood, as well as offering cooked dishes. And then this happened... yup, an authentic German restaurant. 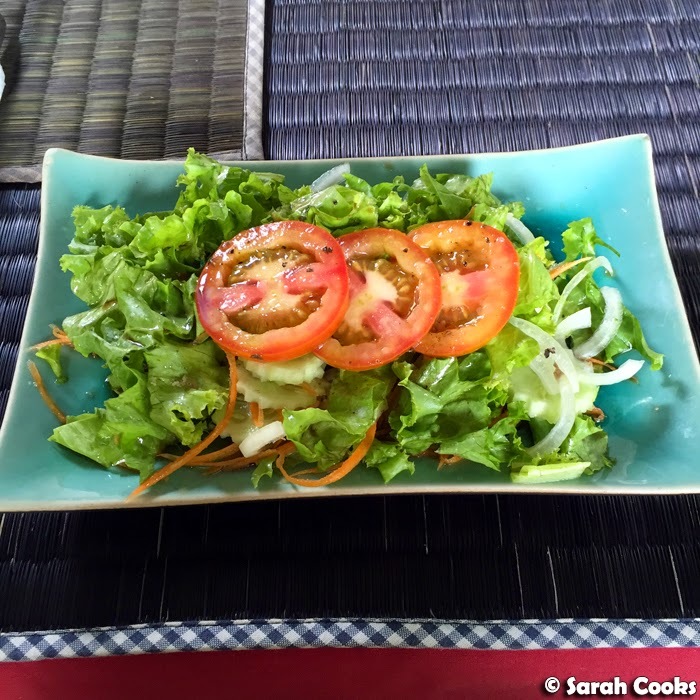 After five days of Khmer food with loads of lemongrass in it, we were really craving something Western. 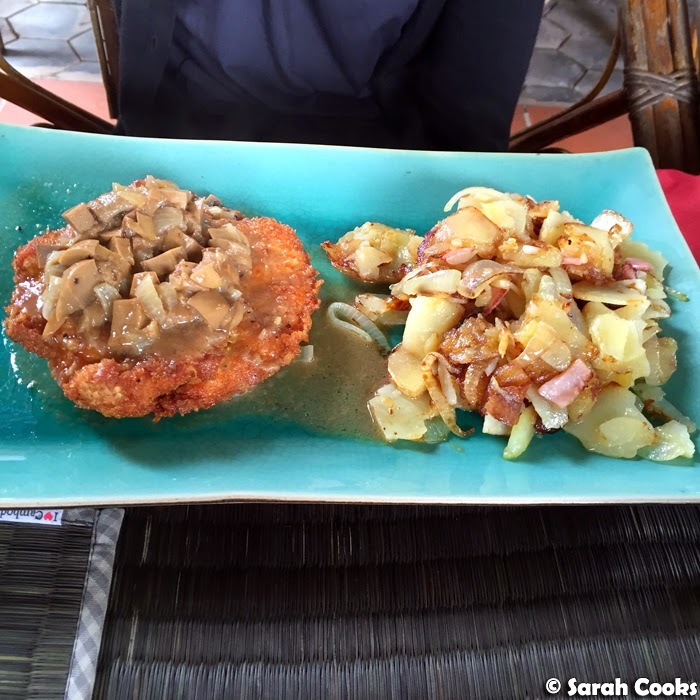 We searched different restaurant options on TripAdvisor, saw a picture of schnitzel and the decision was made! 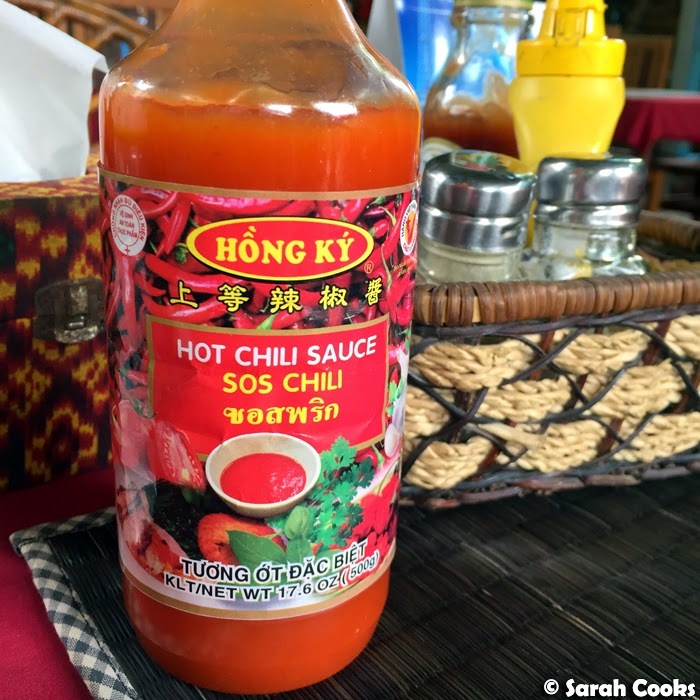 Haus Bremen is owned and run by a German man and his Vietnamese wife - we had a chat to them and they've lived in various cities in South East Asia and are currently settled in Siem Reap. They serve various traditional homestyle German dishes - think Schnitzel (Zigeunerschnitzel, Jägerschnitzel, Cordon Bleu), half chickens (halbes Hähnchen), Kassler, sausages, Frikadellen, Gulasch, Rinderrouladen (beef rolls) and so on. 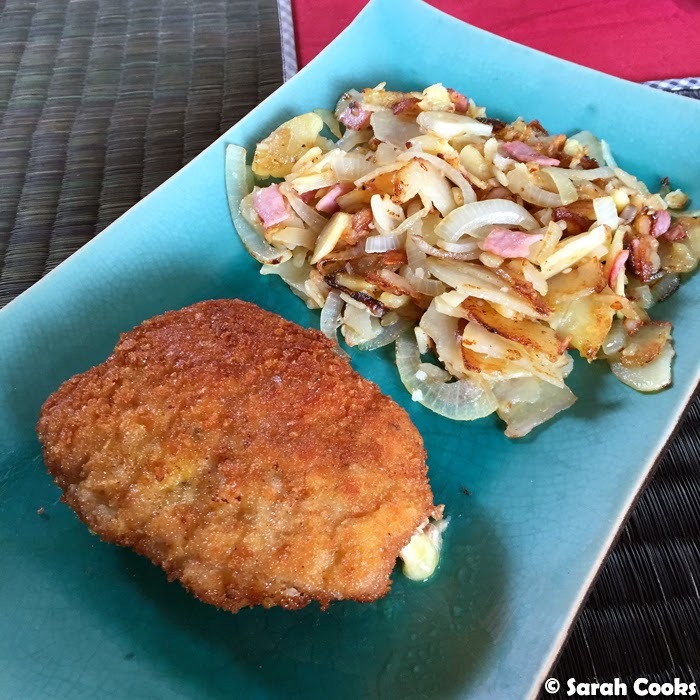 We ordered schnitzels with Bratkartoffeln (fried potatoes with onion and bacon). Just like at home in Germany, the salad was served first. It really tasted like Germany! The food really, really tasted like the food that Sandra's mama in Germany cooks. Sehr lecker! It was strange to be eating the type of food Sandra grew up with in the middle of a totally foreign city, but totally awesome. 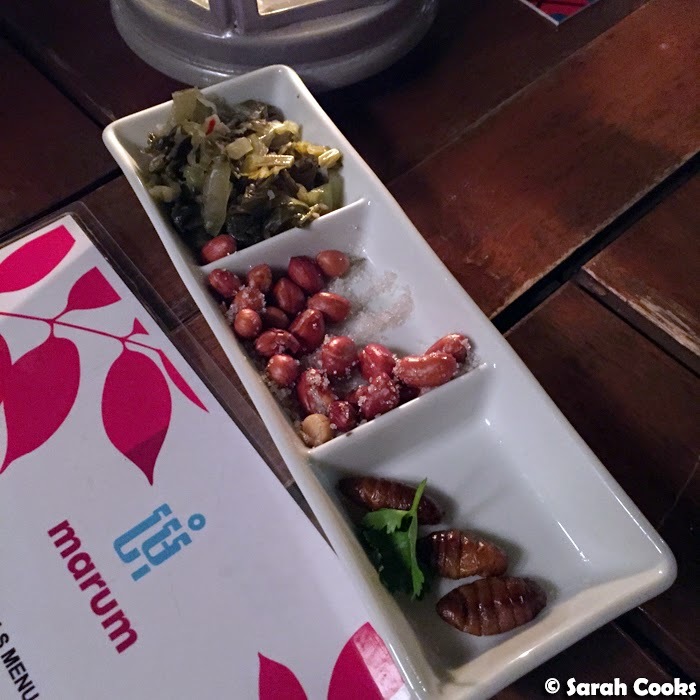 The last restaurant I want to tell you about is Marum, a training restaurant for former street youth. My friend Penny suggested it. Penny and her friend Michelle are currently volunteering in Battambang (what legends! ), and came to Siem Reap for the weekend to visit and catch up. It was lovely sitting in the open air with all the sparkly lights in the trees. 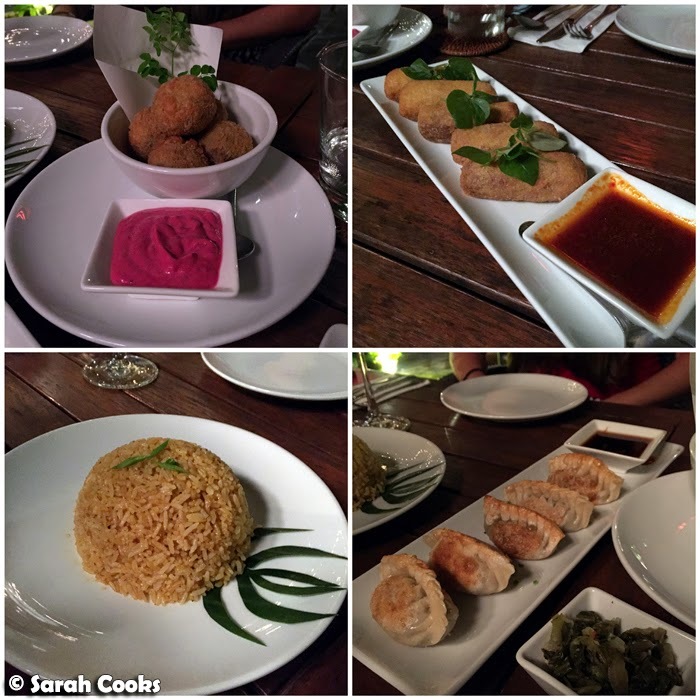 Marum serves sharing plates with no single influence - Khmer, Western and pan-Asian flavours all make an appearance. 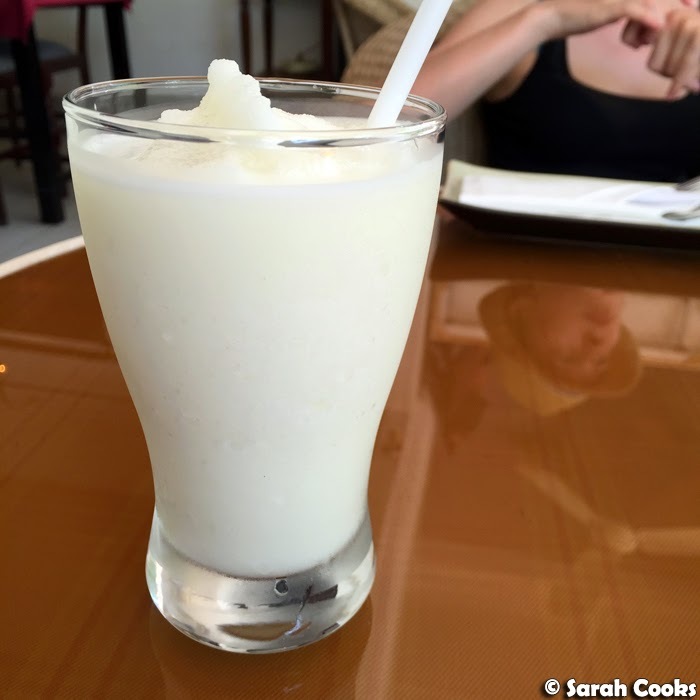 If you're feeling adventurous, you can even order tree ants, silkworms and duck embryo! We were... not feeling particularly adventurous though. I did, however, try the ant larvae that were provided as an appetiser - they were kinda salty and a little mushy. We ordered a few dishes to share - and looking back it seems we were really in the mood for deep-fried food! 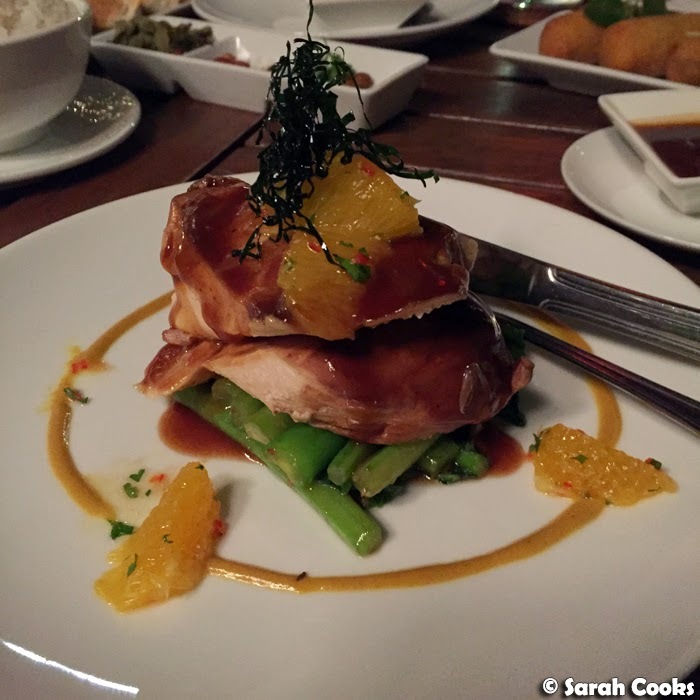 I really enjoyed the tea smoked chicken - it was lightly smoky and very tender, and had a nice, slightly sweet citrus honey glaze. Desserts were very nice overall, except for the crème brûlée, which was a little eggy. The mango and coconut sushi was a fun way of combining traditional South East Asian Flavours. Penny and Michelle loved the banana fritters with their crisp coating of coconut and sweet drizzle of palm sugar caramel. My favourite, however, was the chocolate cake with kampot pepper. Fresh green peppercorns were folded throughout the cake and in the passionfruit syrup, adding a mild spiciness. It worked really well! 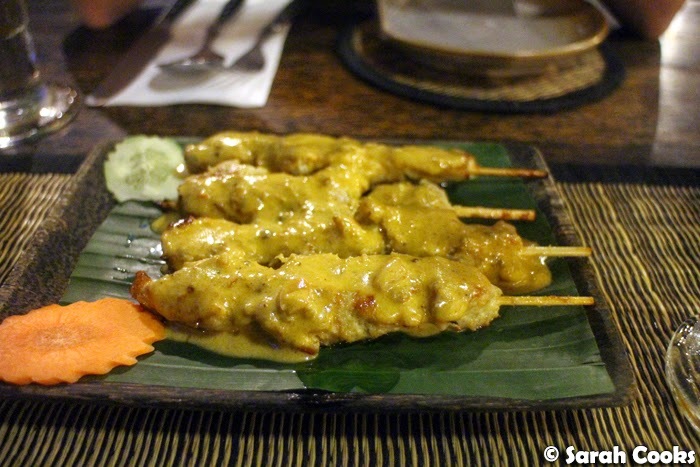 And those were the restaurants we tried in Siem Reap! 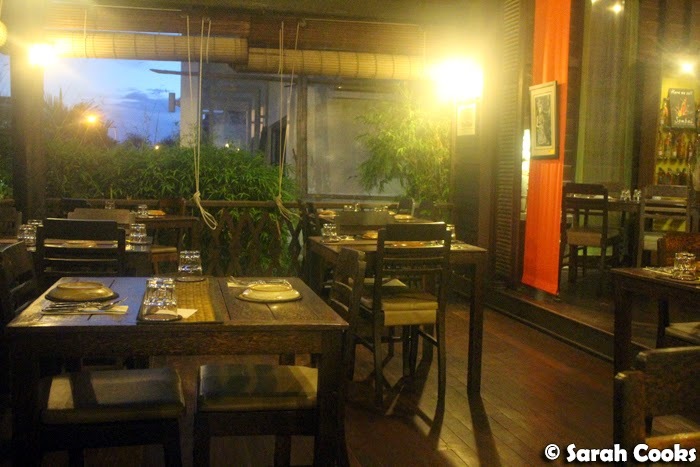 Our hotel, Shinta Mani Club, had a great restaurant too, but I'll tell you about that when I write about the hotel. Soon! 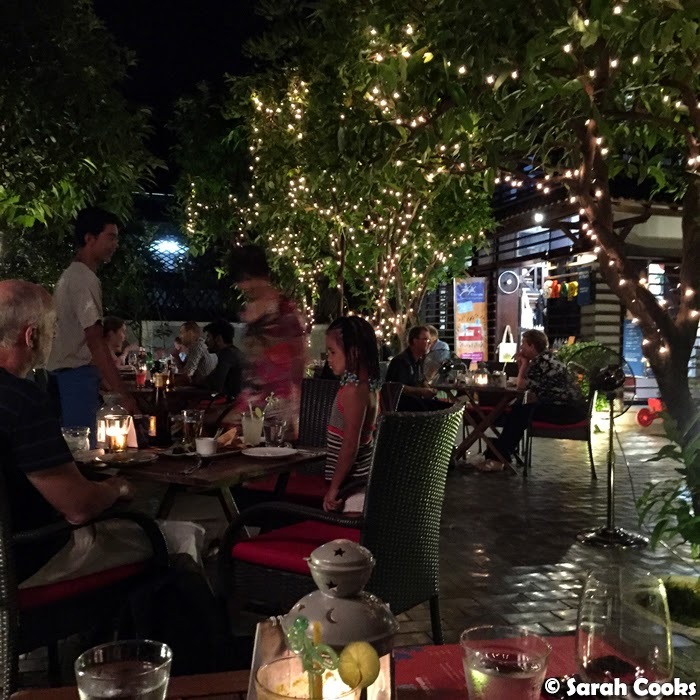 Do you have a favourite restaurant in Siem Reap? 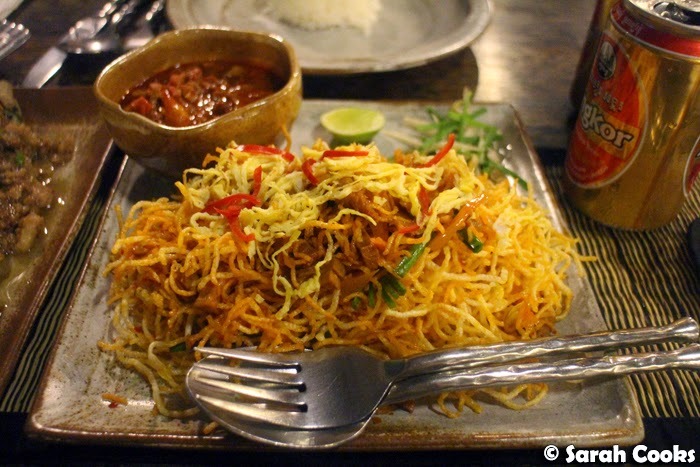 How do you choose where to eat when in a foreign city? Have you tried insects before? The deep fried eggplant is calling me. The ant larvae not so much. :) What a wonderful getaway! I will be trying all these places. Thanks for the recommendations... and I'm meant to be the local! That schnitzel will save my sanity around the 8 month mark, I think. Hehe you know after I read your last post I actually priced holidays there. Alas, everything was booked up for the holiday season but it is now definitely on the radar! Ermahgerd that platter for one looks amazing. Also can't stop staring at that fried eggplant. Gah! So many delicious foods! 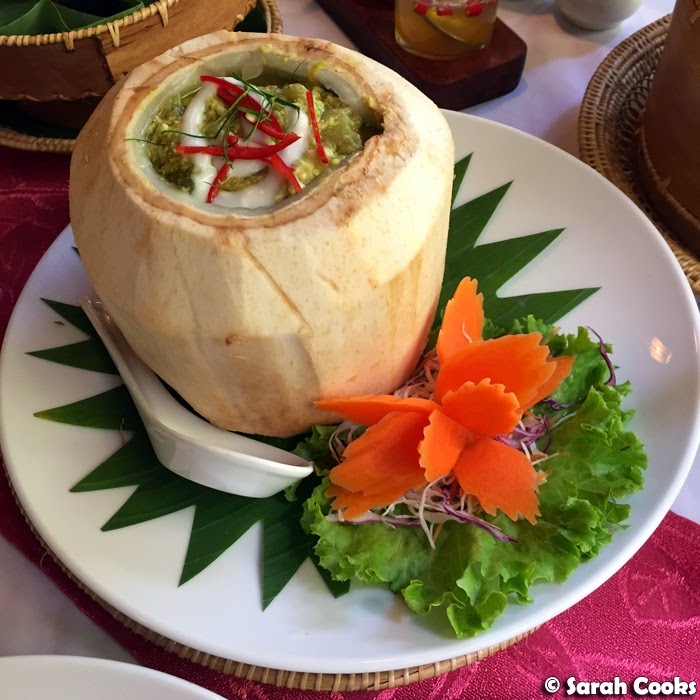 I especially like the ones with the more interesting presentation - in a coconut in particular!